A still from a security video obtained by the Miami Herald of an inmate attack at TGK. Miami-Dade Corrections officials are investigating a security breach and inmate attack at the Turner Guilford Knight Correctional Center that was caught on surveillance video. The incident, which took place back on June 14, ended with inmate Kenneth Williams suffering from a fractured vertebrae and broken ankle, and questions as to how the attack could have happened. In the video, obtained by the Miami Herald, cell doors are shown sliding open in the hallway of a maximum security wing as a shirtless Williams appears. Williams is confronted by two other inmates, something is said and Williams takes off running, with four inmates following. Union leader John Rivera said Officer Jonathan Quijano's calls for help initially went unanswered when he was allegedly attacked by inmate Jovens Esperance because his emergency equipment malfunctioned. 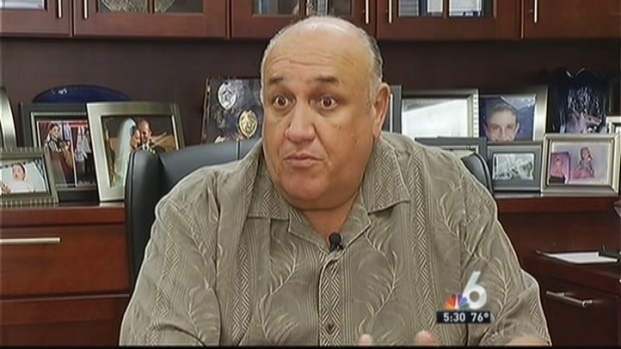 Miami-Dade Corrections Director Timothy Ryan addressed the issue on the phone with NBC 6. Williams backs away from the inmates. As they close in, Williams decides to jump from the second-floor balcony, the video shows. “I jumped because I was in fear of my life. I seen a couple of inmates coming towards me with knives in their hands," Williams told NBC 6 in a jailhouse phone call. Officers said the inmates had homemade knives, according to the Herald. The video doesn't show him fall to the floor below, but the next scene shows him on the ground, grabbing his ankle and his back in obvious pain. Another man, identified as Rafael Andres, comes to his aid and appears to accept a blade from Williams, the Herald reported. Officers are seen moving into the area and taking control of the situation. The officers pepper-sprayed the attackers and confiscated at least two homemade shanks, the Herald reported. Miami-Dade Corrections Director Tim Ryan said the department is investigating how all the doors of the wing opened at once and whether the inmates knew the doors would be opening. "It is suspicious," Ryan told the Herald. Investigators are also looking into the computerized control panel that controls the sliding doors. Prosecutors are also reviewing the incident. Williams, a reputed Liberty City gang member, was behind bars on a witness tampering charge after he and his brother were accused of threatening a witness to a 2008 murder of a rival, the Herald reported. His trial is expected to begin next week. Williams told NBC 6 there had been trouble with the cell doors several times before. The first time they opened there was a riot, he said. Internal corrections reports filed by three officers who responded on June 14 indicate the officers were caught by surprise. It was a short time after the malfunction when Williams felt he was in danger. “It seems like it was well planned, well orchestrated, and obviously this was something that may have been done with the help of those who work inside the jail,” his attorney Jean-Claude Dugue said. The corrections department said in a statement that the incident is still being investigated and that it may not comment on it.